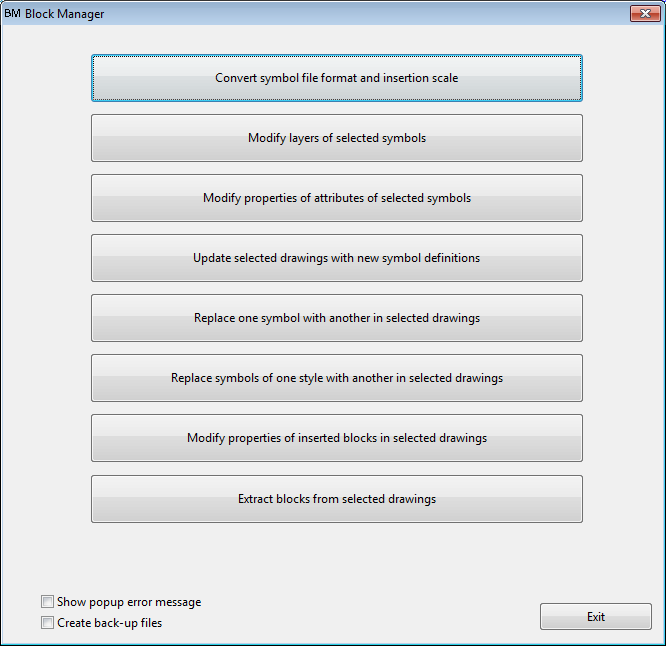 Block Manager is an independent Elecdes utility made up of several tools that allow users to modify Elecdes symbol and drawing files, and to update/change Elecdes schematics (which manage Elecdes symbol drawing files), within a directory. Block Manager runs directly from Windows, without having to run a CAD package. Block Manager allows backup files to be created. Use the checkbox on the main dialog to cause backups to be created when any symbols/files are modified. This is a wise precaution. To avoid the possibility of many warning messages occurring, it is possible to disable pop up messages using the checkbox on the main dialog. Convert symbol file format and insertion scale. Modify layers of selected symbols. Modify properties of attributes of selected symbols. Update selected drawings with new symbol definitions. Replace one symbol with another in selected drawings. Replace symbols of one style with another in selected drawings. Modify properties of inserted blocks in selected drawings. Extract blocks from selected drawings.